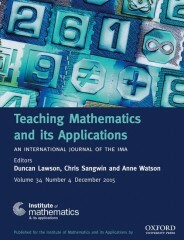 Teaching Mathematics and its Applications: An International Journal of the IMA provides a forum for the exchange of ideas and experiences which contribute to the improvement of mathematics teaching and learning for students from upper secondary/high school level through to university first degree level. Mathematics and statistics anxiety is one of the major challenges involved in communicating mathematics and statistics to non-specialists. Students enrolled on degree programmes in several areas other than mathematics or statistics are required to study mandatory courses in mathematics and statistics as core elements of their degree programmes. Academics, educators, and researchers presented papers on how they have addressed this issue of anxiety using history, enhancing students’ self-belief, and individual support, demonstrating the relevance of the subjects to their respective degree work and making the learning process enjoyable. This range of cultural, socio-economic and academic backgrounds of students manifests itself through diverse expectations and individual learning requirements that need to be carefully considered. Delegates agreed that if educators involved in designing and delivering mathematics and statistics courses for non-specialist university students are aware of the implications of this diversity in student backgrounds, they should be able to appreciate the indispensable role of using a variety of teaching and learning approaches. My personal view is that thinking like social scientists would make higher education practitioners more empathetic towards students. I think making course delivery student focused as well as student led would encourage students to share responsibility for their education. Focusing on connecting with students and being perceptive as well as receptive to students’ feedback and willing to revise teaching delivery can enhance the learning climate in teaching rooms. This would promote student interaction and encourage active learning. Undergraduates can face several issues during their transition to university education, such as key gaps in their mathematical skills despite the fact that they have A-level Mathematics or equivalent. Effective practices were shared to include a blended learning project using online formative assessment followed by feedback and encouraging students to work within their Zone of Proximal Development (Vygotsky, 1978). Delegates were informed about two innovative Mathematics Support Centres (MSCs) that facilitate distant learning. MSCs have become important features of universities in the UK as well as overseas. Undergraduates can face several issues during their transition to university education, such as key gaps in their mathematical skills despite the fact that they have A-level Mathematics or equivalent. Educators shared their projects on scenario based training of statistics support teachers, instruction methods developed by mathematics teachers and using census data as well as other publicly available large data sets to support statistics literacy. Social media was explored as a tool to facilitate deep learning, enhance student engagement in science as well as engineering and improve students’ learning experience. There were presentations on the effective use of a virtual learning environment, audio feedback, and an online collaboration model to encourage students’ participation. Delegates seemed to find online formative assessment practices worth incorporating into their teaching. The innovative Mathematics Support Centres (MSCs) that facilitate distant learning sounded appealing to several others. Delegates who had not experimented with Facebook were convinced after a paper presentation that Facebook is an area worth exploring to enhance student engagement. I have used Facebook for promoting scholarly dialogue and collaborative research as well as enhancing student engagement with statistics and operational research methods since 2012. My rationale is to address mathematics and statistics anxiety by connecting with students which can be done without intruding into their personal territory, i.e. becoming their Facebook friends. I would argue that Facebook is an excellent online system which academics can use for posting topics for discussions, promoting interaction, addressing students’ queries, uploading course material and monitoring students’ progress. These study groups are easy to set up and promote inclusive education. It is a platform students are used to and view extremely positively. Barriers to learning such as neurodiversity were also explored focusing on learning difficulties faced by visually-impaired and hearing-impaired learners. Other areas covered included language difficulties as a barrier to reading mathematics, dyslexia/dyscalculia and teachers’ negative bias against students from certain backgrounds. Gender imbalance was also discussed as a significant barrier with the general consensus being that more women should be encouraged, as well as supported, to pursue careers in mathematics. In light of the existing literature and research relating to the difficulties blind learners face, it was agreed that this is an area that calls for further research to make mathematics more accessible to the blind. It was proposed that research on combining lexical rules, speech prosody and non-speech sounds would be desirable. Furthermore, providing tools for carrying out mathematical analysis may improve the situation for blind learners. A critique on the fallacy of assuming a homogeneous student body and homogeneous teaching in a ‘what works’ approach introduced an interesting point of controversy in the midst of excitement and optimism about a range of initiatives. These exchanges of information on research, initiatives and projects should promote multi-disciplinary research collaboration in mathematics and statistics education. The conference might impact research in a variety of themes related to statistics and mathematics education to include mathematics anxiety, inclusive practice and statistics anxiety. A version of this article originally appeared on The London School of Economics and Political Science blog. Featured image credit: calculator mathematics maths finance by Unsplash. Public domain via Pixabay. Meena Kotecha is an invited member of the RSS Education Committee and has been teaching mathematics, statistics and operational research methods at the London School of Economics (LSE) since 2006. She is an LSE Teaching Prize Winner. Previously, she was a course leader at the University of Hertfordshire. In 2003, she was awarded Chartered Mathematician’s designation by the Institute of Mathematics and its Applications (IMA). She was recently listed on Jisc’s list of 50 most influential university education professionals on social media. She has jointly organized an international conference on Promoting Mathematics Resilience at the University of Warwick.